The Football Budget is handed to every person who buys an admission to a WAFL football match. Because it is specific to the match you’re watching, you always open it and you always read it. As much a part of WA football as the pie, the Sandover Medal and the hospital handpass. A promotion for the Office of Road Safety saw the Budget “belly-banded” with a seat belt. Inserts and wrap-arounds can be arranged. Everyone reads it at the same time so it lends itself strongly to promoting events on a Saturday night or a Sunday. 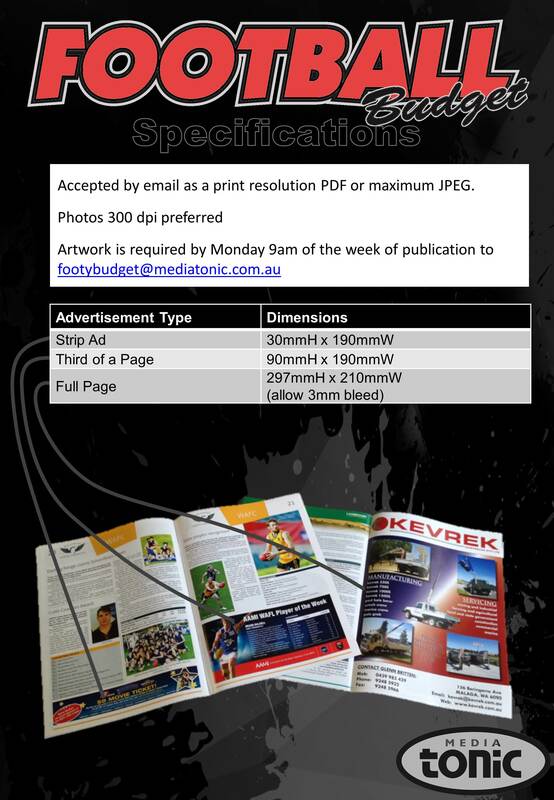 The Football Budget is published 27 weeks of the year and includes a mid year edition dedicated to country football. Easy access to the hopelessly dedicated sports fan who actually gets out of the house regularly.